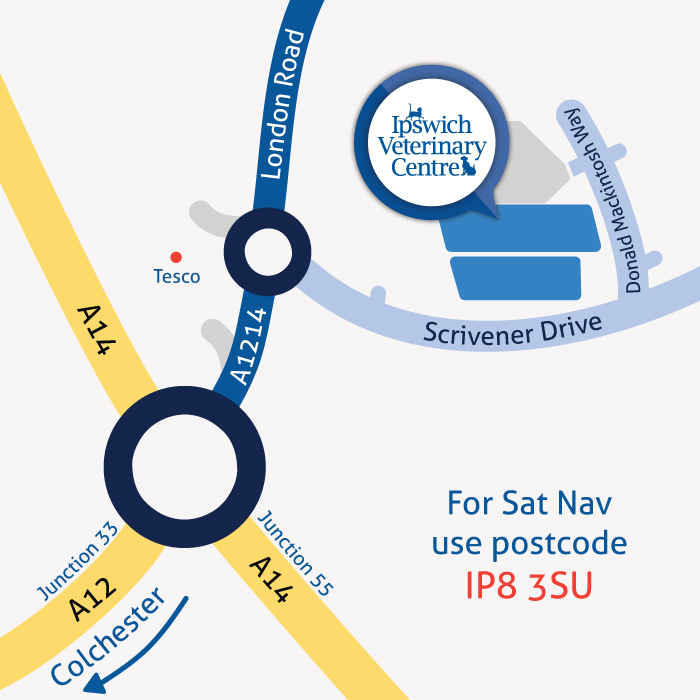 Ipswich Veterinary Centre is located on Scrivener Drive and is adjacent to the A1214. Our main entrance to the car park is easily accessible and easy to find. At the roundabout (A12), take the second exit onto the A1214, signposted Ipswich West, A1214. At the next roundabout, take the third exit onto Scrivener Drive, signposted Pinewood and Belstead; we are just a little way down Donald Mackintosh Way on your left. Travelling westbound on the A14, leave at junction 55 – signposted Colchester, Harwich, Ipswich West A12 (A1214). Then, at the roundabout take the third exit onto the A1214. At the following roundabout, take the third exit onto Scrivener Drive, signposted Pinewood and Belstead; we are just a little way down Donald Mackintosh Way on your left. Travelling eastbound on the A14, leave at junction 55 – signposted Colchester, Harwich, Hadleigh A12 (A1071). Then, at the roundabout take the first exit onto the A1214. At the following roundabout take the third exit onto Scrivener Drive, signposted Pinewood and Belstead; we are just a little way down Donald Mackintosh Way on your left.